Breaking wave coming from in front? Punch through it. Breaking wave coming from the side? Paddle brace on the wave, raise the downwave edge of your kayak. Wave coming from behind? Surf it. If a steep enough wave, green or breaking, comes up behind you, you can lean forwards, take three or four hard forward paddle strokes and you're surfing. Surfing a kayak is good fun, builds your skills and confidence like nothing else, and is perhaps the best way to ensure that you roll your kayak every time you capsize at sea. The wave above is big but friendly. It's about 8 feet high but its shape and speed mean that it is easy to catch, easy to ride, and won't suddenly land on your head like a snooker table. Later we tell you how to recognize an unfriendly wave. 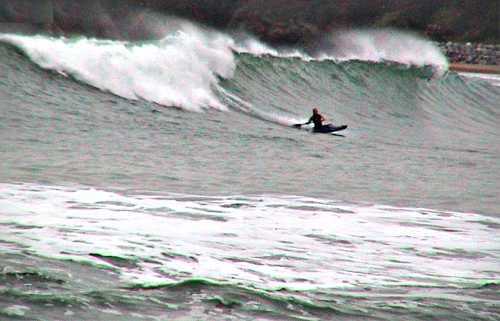 If you want big, wait for winter and go to a beach on the downwind side of an ocean. See Wind & Waves. Start small. 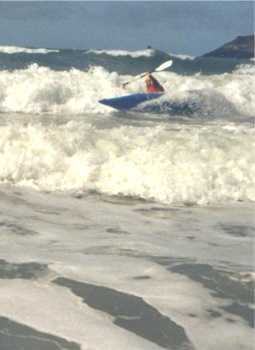 A sea kayak is fast enough to catch a small wave like this one, which will give you a very gentle ride. Surf = waves in shallow water. Out in mid-ocean, strong wind creates a rough sea of steep waves. When the wind dies or changes direction, the waves fade away and cancel each other out. However if mid-ocean wind blows consistently for a long period it will create a pattern of shallow, fast-moving waves that can travel hundreds of miles until they hit land. This is ocean swell. Swell moving through deep water makes the surface rise up and sink down again, but the water itself does not travel anyplace. It is a green wave, energy moving through water. It does not steepen or break unless it encounters a contrary wind, a strong contrary current, or shallow water. When a wave enters shallower water, the bottom of it drags along the sea bed and slows down. The face of the wave steepens. When it gets too steep, it breaks and the water on top falls or slides forward. It is a breaking wave, tons of moving water. A spilling wave invites you to dance, a plunging wave gives you a football tackle. Spilling waves. Also called feathering waves, they occur mainly on sandy beaches with a very gentle gradient. The wave starts to feel bottom while still a long way from the beach. It peaks up enough to make the crest start to break. 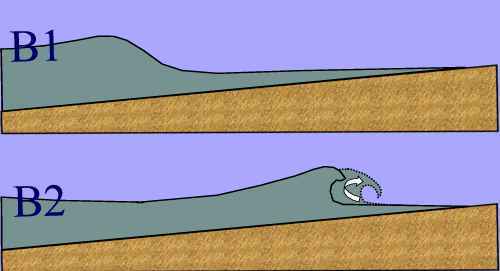 The face of the wave is shaped like a ramp. For some distance before the wave reaches the beach, the crest constantly breaks and spills forward down the face. A spilling wave leaves a long, broad trail of foam like a lace tablecloth. Small ones are slow, gentle, and provide a good introduction to kayak surfing. Larger ones are more of a challenge. At the top of this page is a big but very friendly wave. Compare with the one below, which may be spilling in the distance but definitely has some solid water falling forward off the crest in the center. It looks fun but a bit of a rough ride. If the crest spills forward so far that it covers most or all of the face of the wave, it's mushy. It can be fun but it isn't a thrill. Plunging waves. The bad boys. Also called shorebreak or dumper waves. They occur most often on reefs, and on steeper beaches of shingle or cobbles where the waves do not feel bottom until they are almost on dry land. Each wave then peaks up quickly and breaks violently. Basically, the wave stands up, trips over its own feet and falls forward as solid water. It is never comfortable to be under the falling water. If it falls much more than 3 feet it may blow your sprayskirt off the coaming, scoop you out of the kayak and rip your boots off. Large barrelling waves are good for experienced short-board surfers who have the maneuverability to stay close to the shoulder but not go over the falls with the solid water. 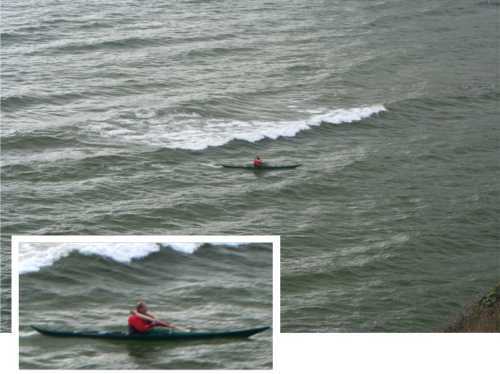 A good rule of thumb for kayakers is "if the waves make a tube when they break, go someplace else". Dumper waves are very easy to recognize from the beach. They are not quite so easy to recognize when approaching from seaward but look for a wave that suddenly peaks up (you will see the water change color as it starts to reflect the sky at a different angle) and then suddenly disappears as it topples forwards. Dumper waves don't leave the long foam trail of a spilling wave. As a really big dumper topples forwards you may also see spray being blasted out vertically because the toppling crest wraps round the air in the tube and compresses it until it squirts upwards. You will probably never see that in your sea kayaking career. For your options, see Getting Back To The Beach. A shingle or cobble beach is sometimes too steep even for dumper waves so it gets surging waves instead. These don't really break, they just rush up the beach with enough power to knock over anybody standing in the shallows and then rush straight back down again. Their backwash or undertow can make it very hard for a swimmer to get back to land again. Any beach with a steep profile will be difficult or even dangerous during strong onshore winds. But 99.999% of the time dumpers and surging waves are just inconvenient.